Read the temperature in your pool or pond the quick and easy way with the Little Giant Floating Pond / Pool Thermometer. 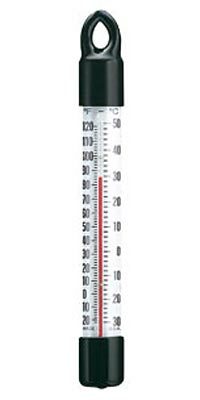 This durable and easy to read thermometer maintains vertical buoyancy to make reading temperature at a glance a simple venture. This unit features resilient rubber caps and a 0.5" lanyard ring at the top, with an included tether for easy anchoring or retrieval. The indicator marks range from -20° to 120° Fahrenheit on one side and from -30° to 50° Celsius on the other. Monitor your water temperature with this Floating Pond/ Pool Thermometer.